Here is another type for attachment_fu users. This evening I wanted to try Railroad to generate one of my app diagram. I alreay wrote my own script generating a .dot file that I usually import in omnigraffle before exporting a pretty version for my clients. The thing is, my script is quite simple and only covers models while railroad also deals with controllers. and here is the ‘pretty’ error message I got. No worries, Technoweenie didn’t mess up, it’s just that I use s3 for storage and his great plugin checks on the environment to load the proper credentials. 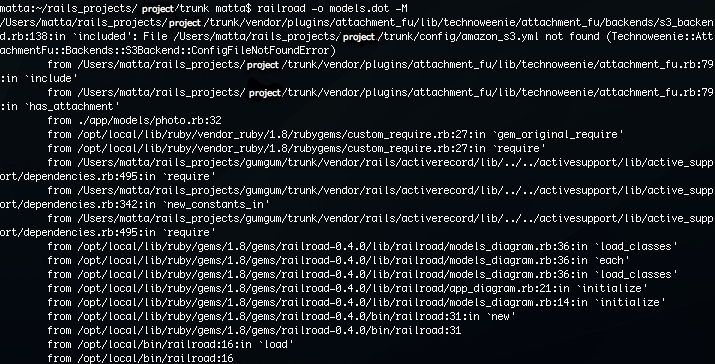 Since railroad doesn’t care about the environment, RAILS_ENV isn’t set and my model diagram isn’t generated.